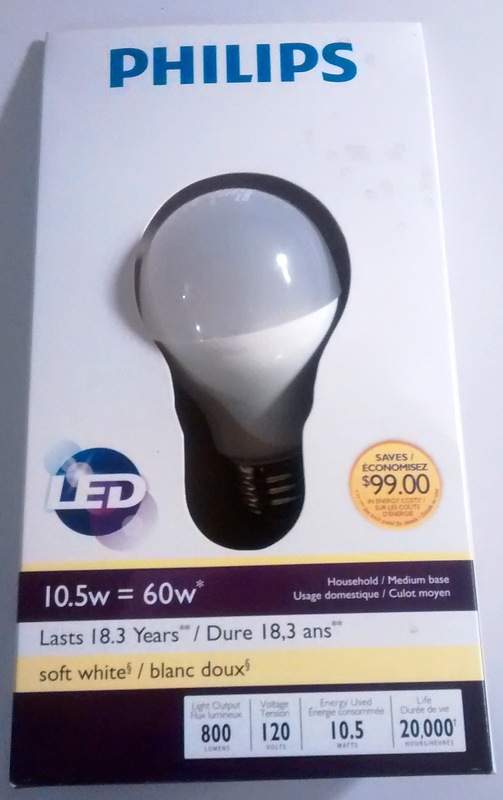 2 Years ago, after moving into our home in Ottawa, we began gradually converting our light bulbs from regular 60 watt incandescent bulbs over to LED bulb technology. A few months after moving in Home Depot had some Philips LED bulbs on sale at a decent price. I picked up ten and ventured onwards to install them throughout the house. I had planned on adding more of the same model as my budget permitted but unfortunately, Home Depot had this particular Philips LED bulb as a "special buy". This meant Home Depot had specially ordered this model line of bulbs for the special sale only and once they were gone, they were gone. Nonetheless, I kept the packaging so that I could possibly find a close match in the future for other rooms in my house. Why did I hold onto the packaging? When it comes to purchasing light bulbs I like to consistently purchase the same style of bulb over and over again . This provides the same shade of light and brightness throughout rooms in my house. A major pet peeve is walking into restaurants and noticing the soft whites, warm whites and daylights all intermixed. It's not hard to keep everything a similar colour by standardizing light bulbs or at least their the shade of lighting. Philips warrants that this bulb will be free from defects in material and workmanship and will operate 6 years based on up to 3 hours average usage per day/7 days per week, when used as directed. If this bulb does not conform to this warranty, Philips will send you, at its election, a replacement bulb or refund your original purchase price upon receipt of the returned bulb, register receipt and proof of purchase. Please call our toll-free number, write to Philips or send an email at the website below to find out how to return the bulb. This limited warranty does not cover bulbs subject to accident, neglect, abuse misuse or acts of God. REPLACEMENT OR REFUND IS YOUR SOLE REMINTY. EXCEPT TO THE EXTENT PROHIBITED BY APPLICABLE LAW. THE DURATION OF THIS WARRANTY, LIABILITY FOR INCIDENTAL OR CONSEQUENTIAL DAMAGES IS HEREBY EXPRESSLY EXCLUDED. I dialed and seamlessly worked my way through the phone options aiming for the lighting customer service agent. Both the packaging and burnt out light bulb were at my side as James picked up my call. James politely inquired how long I had the bulb and what the issue was. I replied that the bulb was less than 2 years as I had only been in the house for just over 2 years and remember installing the bulb myself. I also noted that I had the original packaging and that the bulbs on average, from my recollection, were on less than 3 hours per day 7 days a week thus well short of the 6 years under warranty and 18.3 years as per the claim of savings in electricity on the front of the package. James apologized for the inconvenience and asked for the UPC code from the packaging. This was simple to retrieve from the bottom of the box. James then took down my name, contact information, where I purchased the product and promised a refund would be sent via gift card in the mail. I should receive the refund in about 6 weeks or so. 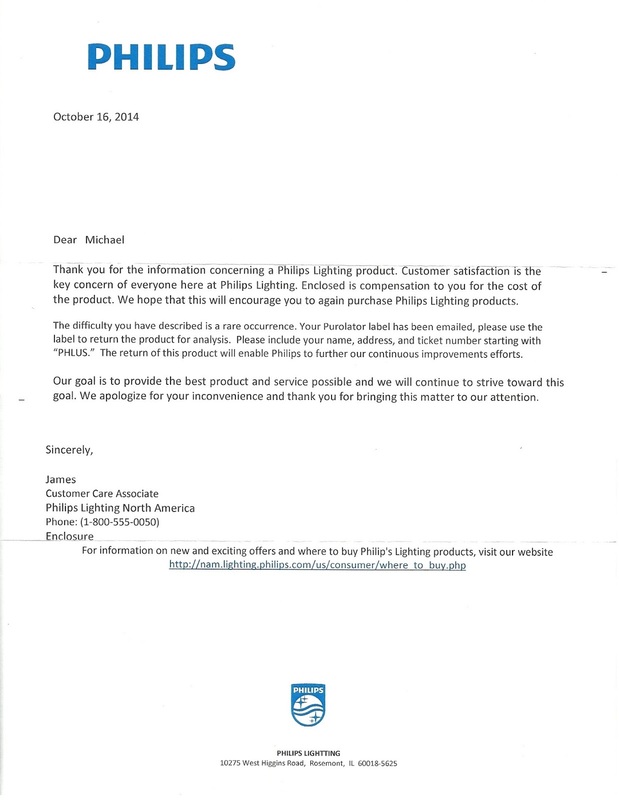 Late last week I received an envelope addressed from Philips Lighting in Rosemont, Illinois. I opened it to find a personalized letter from James with two Home Depot gift cards enclosed as compensation for the product. In fact, the pair of Home Depot gift cards were for more than I paid for the product! The only strange thing about the letter was a mention of a "Purolator label" being e-mailed to me so I could ship the light bulb back for analysis by Philips. But no Purolator label was ever e-mailed to me or included with the letter. I guess either something was mistyped and the e-mail never arrived. Overall, dealing with Philips customer service was quick and easy. One customer service agent quickly took charge of the issue and resolved it without trying to obfuscate or find a way to deny the customer the promised remedy. Philips to me really stands behind their products and when something goes wrong they are willing to make it right.